There comes a point in every home owner’s life when the gutters need to be cleaned. Okay, more often than once. It’s actually a vital part of your outside maintenance and upkeep. If gutters aren’t properly maintained, it can cause a lot of damage because the gutter does an important job of protecting a home or building from the elements. When dirt, leaves, sticks, and other debris begins to pile up, water can’t get through as it’s meant to. Therefore, it’s really important that waste is removed before the water can back up and flow over the gutter instead of going down the downspout. If you let your gutter get clogged up with dead leaves, sticks, and other debris, it can cause some major damage. First, gutters and downspouts are designed to move water away from the home or building. If the gutter gets really full and water is unable to move as intended, you can see water damage appear, especially near the foundation and ultimately into the basement or crawlspace. We all know that’s no bueno. 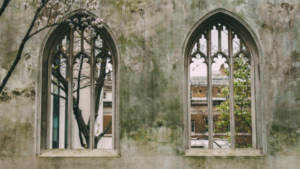 Plus, all that weight from debris can also start to pull the gutter off the roof and away from what attaches them, potentially damaging siding and trim during the process. Do you live in an area that gets really cold? Another possibility when gutters get clogged is the potential of ice dams. That’s when water flows over the edge of the clogged duct only to then freeze. It can mean water is forced into the home or under the fascia on the roofline. Ice is also pretty heavy, so it can end up ripping the gutter right off the home or building. 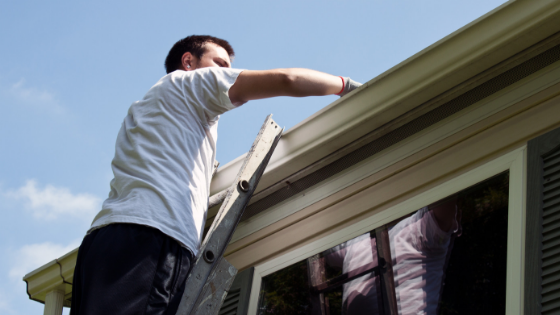 Since new gutters cost about $1,000 on average, that can be quite the repair. Lastly, dirty and clogged gutters are an attractive home for pests you really don’t want making a nest. Carpenter ants, mosquitoes, and even rodents can be found living amongst the debris as it piles up in gutters and downspouts. Once they’re there, they have a nasty habit of making their way into your home. Yuck. On average, most gutters will need cleaned about twice a year, once in the spring and once in the fall. Every month or so, do a visual inspection to check for any clogs. If you live near a wooded area or your home is surrounded by trees, you will likely have to clean the gutters more often, especially as leaves fall in Autumn. Conversely, if you live in the desert you may only need to clean the gutters once a year. It’s nicer to clean the gutter when they are relatively dry. Otherwise, it can be pretty yucky. If you think about it, try to clean the gutter before big storms hit. That’ll really help keep water away from your foundation. Then, do a visual check after the storm to make no big clogs appeared after the downpour. If you are inspecting the gutters and notice snow on the roof and ice dams in the gutters, it’s probably necessary to call a professional. Since the ground is slippery and the gutter is clogged with ice, someone with experience and equipment is the best person for this job. But if the gutters are frozen with debris, you will probably have to wait until a thaw for the professional to clean them. So get your gutters cleaned before winter! In order to do this job yourself, you have to be careful and you really need to have prior experience on a ladder. Make sure the ladder is in good shape and can handle the weight. Don’t ever clean the gutter by standing on the roof and never stand on the top rung of a ladder. If you are unsteady on your feet, afraid of heights or questioning whether you should be doing this, please call a professional. Falling from the gutter level can cause significant injury. Even death. A professional company will not only have the experience to clean the gutter, but they will also have safety equipment that keeps them safe. They will also be able to check for any damage and even make minor repairs if they are needed. If you decide you would rather clean the gutters yourself, here is what you will need. Once you have all your tools together, it’s now time clean the gutter! Pick a starting section, set your ladder up, and climb. Using a garden trowel or just your hands, start scooping out the leaves and waste from the gutter and put it in your bucket. Continue till you have reached all the debris you can in that spot, grab your hose and spray any smaller bits down the downspout. Then get down, move the ladder and start again in the next section. Repeat till all sections have been cleaned out and rinsed off. If you’re young and healthy, you’re probably going to be fine cleaning your own gutters most of the time. But, there are definitely times where you are going to want to hire a professional. Like we mentioned earlier, if there are ice dams, that’s going to be a situation best handled by someone experienced. Additionally, if there are major stains and streaks happening on the outside of the gutter, you likely have a mold and mildew problem, which will need to be killed by a professional. Or, maybe cleaning the gutters sounds like the worst job possible. It is repetitive. If you can’t be bothered to climb up to clean the gutters, a professional can really help with the maintenance of your home and ensure there is no water damage occurring in your home. It’s not terribly expensive, either. Most of the time it won’t cost more than $200 depending on the size of your home and the amount of debris in the gutters and downspouts. If you’re looking for help, IDW is here for you. Learn more about our residential services here.